Juri tread lightly down the beaten path, watching the woods around her for any signs of movement. This place was not nearly the most outlandish setting she'd wandered into here, but it still managed to be the the most unsettling so far. The only source of light was a full moon; filtered through a canopy of twisted, gnarled tree limbs, then reflected off a thick layer of fog enveloping the dirt road which was itself forcefully carved through wicked looking brambles. Every moment was one with bated breath; seemingly waiting for an inevitable masked maniac to lurch out of the haze. Joke's on them, Juri thought to herself. The only monster here is me. She had no way to pinpoint exactly where she was in this forest, but also had no worries of getting lost. After all, this was the only road so far. If there was anybody here, she'd stumble onto them eventually. And the mere fact that she was dropped off in this place meant that someone was around. Well speak of the devil; as the road in front of her began to widen, she also managed to make out the hint of a new light source up ahead. Moving to the edge of the road and slinking down onto all fours so to better conceal her silhouette, Juri cautiously approached what was surely her new plaything. The first thing made clear through the fog was the source of light itself: Apparently, her prey had taken the path opening as a good enough reason to make a campfire. The second item of note was was the subject herself, her form outlined against the blaze. She was facing away from Juri, and wearing some sort of cloak which hid most of her physique to boot, but she could still make out a few interesting details. For one, this person was small. Just, in general. Taking the inherent bulkiness of her choice of clothing into account, Juri had seen more imposing preteens. On top of that she was using the campfire to roast a marshmallow on a stick, and her head bobbed back and forth as if listening to a catchy tune. Was this a child? Like a legitimate, barely-out-of-training-pants kid? wanting to know more, Juri slowly circled the campsite to get a view of her from the front. Juri's line of thought was cut off as a shrill bark rang through the campsite. A moment too late Juri noticed the tiny, scruffy dog which was previously lying next to a picnic basket at the girl's feet, but now was hopping in place excitedly while yapping at this new intruder. With a glance back up she confirmed it: The girl had most definitely seen her now as well. "Omygosh. ", the little lass said, as she let her marshmallow drop into the campfire. Now Juri could have been on them both in an instant. It wouldn't have been hard at all. But all of this together -- the forest, the girl, and most strikingly that hood -- had left her craving to know more. Had she actually just entered a fairy tale here? "Ohmygosh. 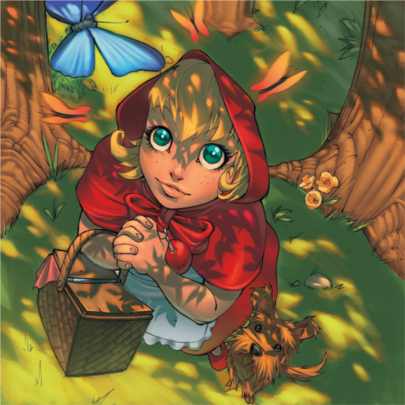 ", the girl in the red riding hood repeated, as she rose to her feet. Juri took this moment to stand up as well; her concealment no longer important. "Omygosh ohmygosh ohmyGOSH!" the girl chanted, as she pranced around the campfire and excitedly grasped Juri's hands. "I am so happy to see you!" "Happy... to see... me?" Juri asked, staring down into the hooded girl's glimmering eyes. "Well, not you in particular. But someone like you." she replied, almost hopping with giddiness. "This is such a spooky place, and we all need everyone we can get!" "We all?" Juri parroted, trying hard to keep up. "Yes, all of us!" the girl in red cheered. "I was here as a lookout, but everyone else is at Grandma's place." Quickly, several gears in Juri's head began to turn. Up until this point, she had only encountered people who were -- in some way or another -- fighters. That would make sense, because someone not willing to kill in this system would last just long enough to be stumbled upon by someone who did. But what if nobody of that sort found them? What if, instead, they met up with another non-fighter? Then another? Then another? What would it be if, eventually, someone like her finally found what was now a colony of 'noncombatants'? Juri knew what to call it. "Everyone would so love to meet you! ", missis Hood continued, as Juri bit her lip with anticipation." "I think... I think I would like to meet them too." Juri trailed slightly behind the girl as she pranced down the path, trying not to gag at the overbearing cuteness as the tiny dog danced around the girl and her oversized basket swayed on her arm. Even though she was almost too much to bear, Juri had to appreciate having her for a guide; they had already come across several forks in the road as they wandered deeper into the forest, and Juri herself knew that she would have had no idea which way led where on her own. At one point Juri actually suggested wandering off into the brush to scout a slightly less bramble-infested area, but her little guide was adamant about never leaving the path. It was very dangerous out there! "So..." Juri started, seeking anything to stop the hooded girl's incessant humming. "Should I just call you Red or what?" "My name's Baby." the girl replied, not missing a beat. "Baby? Your parents actually named you that?" "It's a good name! ", Baby retorted, looking back at Juri with a pout. "But you can also call me Bonnie if you waaAAAH!" Her gaze cast back at Juri, B.B. apparently hadn't noticed a partially-unearthed root in the path. With a shout and much flailing she fell forward in a clumsy mess. "Whoops", Juri quipped, her smile not faltering one bit. B.B. sat there a few moments, nursing her ankle and whimpering. Although Juri was at first just fine with the show, she eventually grew impatient with this delay to her feast. "You getting up any time soon?" she asked. "C-could you... Maybe... Carry me?" Juri glared right back down at B.B., making it clear how little she cared for this proposition. But, as time ticked on, it was obvious that B.B. was not faltering one bit. And she was still the only one who knew where this cabin was. Without a word, Juri begrudgingly helped B.B. up and allowed the girl to climb onto her back. The hooded girl now firmly secure, with her tiny arms wrapped around Juri's neck and her legs clutching Juri's torso, they once again set off. The things I do for jollies, Juri thought to herself. "This is the place, right?" The cabin, located on a small hill in a clearing, was not much of a looker. True to the form of the rest of this place, it still seemed slightly ominous; the trail up the hill was far more twisty than would appear practical, all of the materials the house was made out of seemed slightly warped, and at the end of the day it was still a cabin in the heart of some godforsaken forest. But at the same time, the warm glow pouring out of its frosted windows was an overwhelmingly welcome sight. "About time. ", Juri sighed, as she twisted the knob and pulled open the front door. "I just can't wait to-"
The first thing that hit her was the heat. This was no fireplace warmth. The place was a sauna. Or, more accurately, a smokehouse. The second thing which hit her was the smell. A putrid sweetness of things gone all sorts of wrong. Juri could pick out quite a few all-too familiar stenches, amongst a couple even she had not yet known the horrors of. Their faces were frozen in stifled screams of pure terror. And their throats had been slashed open like livestock, to allow their blood to drain out onto the floor. "I'm so glad that you could make it." , said B.B., her voice having now dropped the saccharine tinge completely. Still slightly in shock, Juri glanced down at the dainty arms wrapped around her to now find a pair of large, wicked knives criss-crossing her throat. "They've all been dying for you to join them, Juri Han." The first movement Juri Han made was a good choice -- perhaps the only good choice given the circumstances -- but that did not make it any less instinctual. Recoiling from the blades, the back of Juri's head collided with B.B. 's chest. This rattling shook B.B's hold, sending the knives clattering to the floor and forcing her to dismount. Whirling around, Juri assumed a combat stance and sized up her "guide" with new eyes. Although the girl still appeared young as ever, the facade of innocence had been torn away; leaving behind a toothy sneer and an intense, hungry gaze Juri was intimately familiar with. She shifted her weight from foot to foot in a sinister echo of the joyful energy from before; her twisted ankle revealed to be just as much a deception as everything else up to this point. Though apparently unarmed now, having nothing on-hand besides that cartoonish basket, she seemed unworried and confident. "Who are you, really?" Juri asked. "Stupid girl", B.B. growled, "I already told you. I'm Baby Bonnie Hood. What you never asked, though, is what I do." ...B.B. had pulled out a shotgun. A full-length, pump action shotgun. Juri saw it happen and she still had no idea how that worked. She had little time to chew on this impossibility, however, as B.B. leveled the weapon in her direction. Juri frantically leapt aside as the first shot boomed through the sweltering cabin. Now Juri could avoid bullets with a little help from her Feng Shui engine, but maneuvering through a cloud of pellets would be a whole other level of impossibility. And at this distance avoiding the entire spread was tricky business by itself. Deciding to hedge her bets, Juri allowed herself to land flat on the floor and rolled back into the "forest" of bodies for cover. It may not do much as a shield, but B.B. would have to come find her first and that would buy her time to come up with a plan. "...Granted, the monsters I usually hunt are usually moreso on the outside..." B.B. continued as if nothing had changed, advancing into the rows of corpses herself. "And hey, some still were! ", she carried on, pushing aside the body of an overly large she-creature who's four arms dragged on the floor. "You wouldn't believe how much Shokan hearts sell for." "But I soon figured out that the really good game around here were the average-looking psychos who just kept flowing in. So many people sporting huge, juicy bounties! Take for example that clown-tramp you're hiding behind-"
B.B. spun and blew through the cadaver of a corseted woman in whiteface, a mere moment after Juri had scrambled to another location. "- she's worth a cool half mil. Not for anything special about her; she just pissed off that many people back home. But I'm preaching to the choir here, aren't I Han?" There was no reply from Juri, as she was currently attempting to maneuver between the carcasses of a white-haired woman in flame-decal'd leather and some sort of skimpy nurse with bizarre red eyes as silently as possible. "You, Juri Han, have so many people out for your head I don't even know who I'll take it to yet. There's the FBI, CIA, Delta Red... hell, even Shadaloo and S.I.N. are pretty good options. I'm thinking that with the payout I get from you I'm going to finally snag one of those experimental laser-sword-thingies I've seen floating around on the black market. Vwoom vwoom, yeah!" As much as she wished the girl would just shut up, it at least gave Juri a good gauge of what areas she should give a wide berth. Not that she intended to stay here much longer. As B.B. continued to ramble and search the corpses, Juri had completed circling around back to the front and had just exited the "maze" to creep off via the entryway. The entryway, she discovered to her dismay, being occupied by a familiar scraggly dog. Once again the air was filled with shrill yaps, and Juri broke into a run as she heard the shotgun begin to tear through bodies behind her. She wished that she could have stopped to punt that mutt like a football -- so very, very much -- but now it was a race between her making it out the door and B.B. carving a large enough hole through the mass between them to line up a shot on her. As she leapt through the doorway and curled herself into a ball midair to get a nice rolling start down the hill upon landing, she could feel the breeze of a deadly cloud passing through the spot which just previously housed her upper torso. Landing with as much grace as she could could currently afford, Juri broke into a full sprint back to the woods. Let's see that tiny twit try to hedge her in now. B.B. Hood, having freed herself from the tangle of bodies, watched from the doorway as Juri retreated down the hill. She was already too far for Hood's shotgun to actually do anything, but B.B. emptied the remaining shells in her direction for intimidation purposes if nothing else. Satisfied with the current state of matters, B.B. unhooked her basket from her arm and set it down on the ground. Then, taking only a moment to scratch Harry behind his fluffy little ears, began to prepare for the next stage. These were quite possibly the most important choices she would make tonight; although she normally would be fine with carrying her whole armory at once, it was clear now that her current target was simply too fast to waste time rifling around for... well, rifles. She would have to decide what was absolutely essential to take with her into battle. First up was one of her favorite cigars, which she lit and took a deep drag off of. Absolutely essential. Second was an old camera; not quite antique status, but still one of those dinosaurs which you shook the printed photos to help them develop faster. B.B. had taken pains to preserve the bodies of the victims she would want to claim later, but it never hurt to also have some photo documentation to go along with it. She had taken a habit to snapping two mugshots of each target: One before and one... after. The less scrupulous bounty takers would surely get a kick out of them. She clipped the camera to the "belt" of her apron, keeping it on hand for the right moment. Pausing for a moment and cocking an ear, she waited in anticipation for something. A weighty boom was carried to her ears from somewhere in the distance. Sated, she turned back to her preparations. Fourth was a single one of her trusty uzis. She normally would go for both at once, but accurate shots would count a lot more here than spray-and-pray. Humming to herself again, B.B. hood returned to her basket. She knew just the thing to fix that. Lost in thoughts of vengeance, Juri almost missed the tiny click as she placed her foot down in a seemingly normal patch of ground. But notice she did, which gave her just enough forewarning to figure out what the cylinder which shot up nearby actually was. Diving down into the thorns, Juri barely avoided the full brunt of the Bouncing Betty. It's payload -- a scythe of shrapnel shot out at roughly waist height to cut victims in two -- instead tore small chunks out of Juri's back as she tried pressing herself even further into the brambles. Afterwards Juri shakily rose back up, her ears still ringing from the deafening blast and her back oozing blood. Goddamn that kid. She said that it was dangerous off the path. She just left out why. Juri's gaze darted around the forest, now recognizing it as the field of deathtraps it actually was. After a moment of consideration, Juri reached above her and hoisted herself up into the tree branches. It would have been harder for that brat to seed surprises up here. And, just maybe, she wouldn't be ready for a strike from above. B.B. Hood scanned the treetops as she walked down a forest path, waiting for the inevitable strike from above. She knew that Juri had come across of one of her surprises, but also gave her enough credit to assume that it didn't kill her. The logical step from there would be to ascend up the tree branches, since that would allow her to keep the options she wanted with far less a chance of stumbling into a trap. Well, a normal trap at least. Harry began to bark and backed away; a sure sign that he had caught whiff of her target's blood somewhere nearby. Confident, B.B. shifted the bulk of her cargo into a more comfortable position and stood her ground. Damn that dog. Damn that dog! She was going to have to cook up something special for the mutt after she was done with it's master. Grabbing hold of a passing branch and swinging back upwards, Juri just barely avoided plunging directly into a plume of hot death from B.B. 's flamethrower. As B.B. Hood got to work at hosing down the surrounding area, and the dry ancient trees began to alight, the rising flames better illuminated the fuel canister on her back and nozzle in her grasp that were previously lost in fog and shadow. This... was a problem. Previously thought to be an optimal position, it was now only a matter of time until flames crept far enough up to roast her if she stayed still for too long. Now dripping with sweat from the surrounding inferno, Juri danced from limb to limb in search of safety. Giggling with joy, B.B. Hood finished up the last of her fuel and then shouldered off the bulky device. Making sure not to let up one bit, she seized a grenade in each hand and threw them after giddily pulling the pins out with her teeth. Mid-leap, Juri watched in dismay as the tree she was sailing towards lurched and began to bend due to the explosions at its trunk. As Juri landed her suspicions were confirmed: It was no longer able to hold her weight. Although Juri spun around the trunk to make sure that she was on top as it fell, the force sent through her body as she landed with it still rattled her teeth. Hastily scrambling back to her feet, Juri once again picked out her "victim" silhouetted by flames. Sporting a jeering smile that showed many teeth and no remorse, she had just finished loading her freshly drawn uzi with a smooth motion. Fully activating her Feng Shui engine, Juri charged the girl in red with a bestial roar of rage. B.B. had begun to fire as she raised her uzi -- an impromptu deterrence against a direct attack -- but Juri no longer cared. The leg Juri brought forward in a roundhouse kicked was peppered with bullets as it slammed into the gun; the force and energy behind the blow exploding it into shrapnel which tore at Bonnie and Juri alike. Juri's leg was out of commission, but that still left her with one left, which she used as a spring to tackle Bonnie to the ground. Perched on her tiny chest, Juri finally had her. Almost alight with energy from the Feng Shui engine, Juri began to pound away on the petite form pinned underneath her. Gone for now was the idea of playthings, gone for now was the air of aloof smugness, she had been pushed too far. All that remained was the desire to mash and mangle and bite and tear. She had to pay. Too small to break the pin, and no match for the speed and strength of the Feng Shui engine fully unleashed, Baby Bonnie Hood twitched and quivered under the brutal assault. Her cries of pain were quickly muffled by the pulping and swelling of her face, and her back involuntarily arched with every massive blow struck against her forehead. Blood, spittle, sweat, and teeth flew and congealed in puddles as Juri raged on. Eventually, as Bonnie reacted less and less to each strike, tear and gash, Juri slowed her assault; eventually ending with a final, definitive axe-handle strike to Bonnie's fluttering chest. Finally calming, Juri took a deep, slow breath while arching her back. Coming back down from that she turned her gaze down on her victim; licking the blood off the fingers of one of her hands while drawing a heart on Bonnie's splattered blouse with the other. "I really, really needed that. Was it as good for you as it was for me?" "What?" Juri asked playfully, lowering herself closer to Baby's ruined face. It was amazing that she was still conscious. Perhaps not quite as amazing as the cigar still clamped between her her remaining teeth, but amazing nonetheless. "One more time, love" Juri cooed, now down far enough for their foreheads to touch. With that said B.B. raised her head and shifted her lips, shoving her cigar straight into Juri's left eye. Pain surged through Juri's body, followed by waves of vicious energy feedback as the already taxed Feng Shui engine began to malfunction and misfire. Juri fell off to the side and curled up into a ball shrieking, clutching her eye as she crackled and spasmed with energy. "You goddamn, goddamn idiot." Baby Bonnie Hood repeated, as she shakily rose. "You think I didn't know about the gizmo dat replaced yer peeper?" she asked, tapping the side of her less swollen eye for emphasis. "I did my homework. Have you?" Bonnie wandered out of sight for a moment, leaving Juri to writhe in agony alone. But soon she reappeared, dragging something behind her. "I bet you didn't even know how dat thing isn't nat'ral. I don't mean 'growing out of the ground' nat'ral; I mean it shouldn't even exist." With a heave B.B. brought forward her cargo, a smoldering branch covered in flaming leaves, broken off of one of the fallen trees. "Those perks it gives you? Yer lab guys figgered that out by examining how things outside yer little world did stuff like dat. 'orrible, ancient things." B.B. held her lit branch by the as-of-yet unburned base, and with a grunt managed to lift it off the ground. "But how did dey do dat? Simple." B.B. dropped the branch onto the convulsing Juri, her screams redoubling as she began to burn alive alongside the feedback she was receiving. "They called people like me. We go out and kill those basteds so yer eggheads can poke around in der corpses." Her priorities now shifted, Juri began to crawl and roll to escape her fiery prison. After a few moments of agony she managed to writhe free, but cinders dotting her body still burned on. "Yer crutch is an im'tation of tings I kill every day. Dey were older den you. Dey were smarter den you. Dey were faster, tougher, and stronger den you." Juri had pooled her energy to drag herself to standing, leaning against a tree trunk, and turned so to maybe scrape off the embers on her back. Upon facing around she was met by Bonnie, who stabbed her two knives through Juri's shoulders and pinned her against the tree. "But I still got dem in the end. ", B.B. Hood finished, as Juri pawed weakly at her chest. Stumbling back a few dozen steps, in order to get a decent shot. B.B. Hood unclipped the camera on her waist and began to compose a good scene. After taking the picture, B.B. took hold of the photo and let the device itself drop to the ground. Shaking the photograph, she impatiently waited for it to develop. Ah. There we go. It looked perfect. Juri even managed to smile a little bit, with her one weakly raised hand showing off... the ring... around her finger. B.B. Hood's bloodshot, swollen eyes widened; remembering the final grenade strapped to her chest. It pained Juri to look away at what happened next, but she was too close for comfort to the blast anyway without taking some precaution. But as soon as the explosion was over she turned back, eager to verify the aftermath. As the smoked cleared, a pitiful, tattered form melted into view. B.B. Hood's face, -- what was left of it after all of this -- looked down in dazed shock at the yawning chasm that was now her torso. What little was left in there was still closer in appearance to ground burger meat than anything else, and her entire body was now as bright red as the tattered, torn cloak you could now see straight through to. "That's what you get!" Juri cheered with malice. "That's what happens when... you..."
Juri began to realize: B.B. Hood was still standing. Juri watched with horror as Bonnie's ravaged form looked back up to her and took a shaky, uncertain step. Another step, as Juri struggled to pry the knives free. More steps. Woozy, but consistent. "Why won't you fall? Why won't you just..."
B.B. Hood was upon Juri now, the labored breaths made by whatever was left of her lungs highlighted as puffs of mist in the fog. Wordless, soundless, she crumpled against Juri's abdomen. Realizing now that there was no threat left, Juri shakily raised her arms to embrace the trembling remains of her foe. She felt the hitching breaths against her stomach slow and slow, until finally there was no more. It was now just her in this aftermath of hell. Her and the corpse of a worthy opponent. Well; her, the corpse, and a tiny mutt gnawing at her pants leg. When I get down you are so next, Juri dreamily thought to herself. Everything hurt. Everything hurt so, so much. But, sitting in front of the campfire which started all of this, she couldn't help but feel at peace. Sure, it would be a good while before she would fully recuperate from today. And sure, things got more than a little out of hand. But, looking back, it was an experience she wouldn't trade for anything else. Today tested her limits. Today measured her abilities. Today made her feel many things that she thought her blackened heart had been completely shut off from. And hey, she even snagged a few goodies along the way. By her feet rested a familiar picnic basket. Still utterly baffled, she had gone back to check it out once she was well enough to do so. She learned -- well -- absolutely nothing about how it worked, but that didn't mean it couldn't be put to good use. Juri had meticulously emptied it of all its weaponry, as she had no use for such... impersonal tools. What she did need, though, was a good way to carry around anything she wanted to keep in this madhouse. 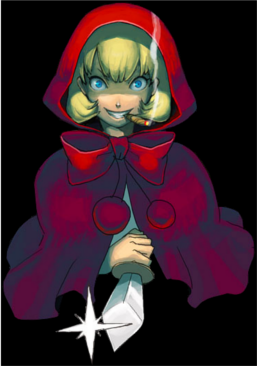 As of right now it was fairly empty -- containing only two knives wrapped in a tattered red hood -- but she was sure that it could be filled over time. With a grunt of pain, Juri leaned over the campfire to better examine the meat she had cooking. It still needed a little more time; not all of the fur had burned off yet. The perfect end to a perfect day, as far as she was concerned.